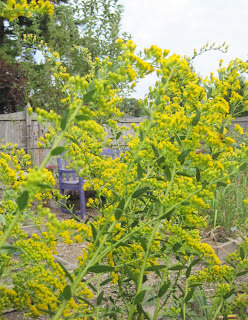 ﻿ Welcome to Garden Bloggers’ Bloom Day for September 2010. My garden cries out for rain. Half way through September, it still seems like August, hot and dry. I long for rainy fall days, when the rain falls throughout the day and drips from the leaves as they cling to the trees for just a few more weeks. Instead, I must live and garden with my current reality. The earth is cracked, some flowers are either dried up or wilted, and I’m running around watering as much as I can. Fortunately, though, some flowers are blooming and the season still provides a few surprises, like a lone Delphinium bloom, a reminder of June days in the garden. Ah, yes, June. That was the month it rained so much that we thought the garden would be growing and flourishing forever. Elsewhere in the garden, back where the vegetables grow, the marigolds, zinnias, mums and a few sunflowers carry forth. ﻿My goldenrod is in full bloom. ﻿ This is my rare Solidago shortii, now covered with pollinators. I hope for some self-sowing from this beauty of my fall garden. Out in front, the Heuchera are blooming, but I took no pictures, because it is hard to get a picture of their dainty flower spikes. Likewise, no pictures of the Panicum virgatum 'Shenandoah’, switch grass, also blooming. 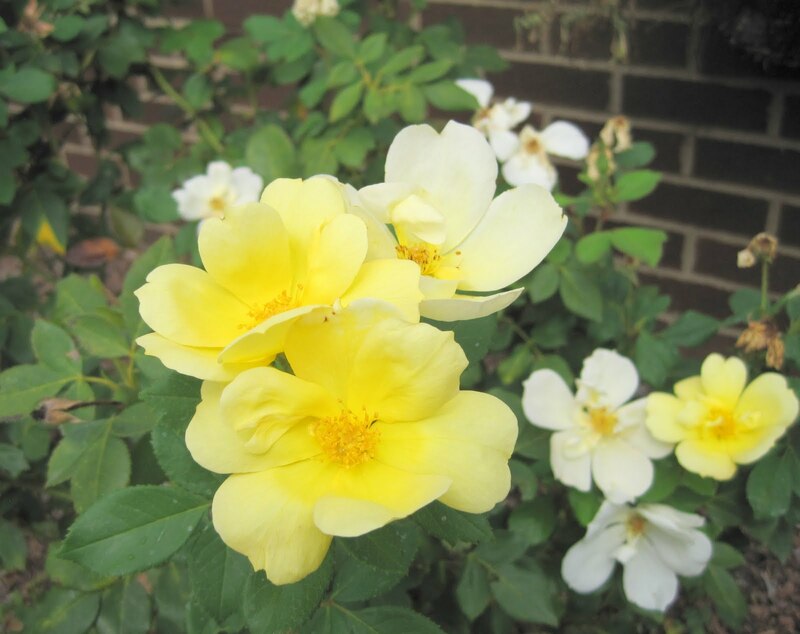 But how about pictures, once again, of the yellow rose of the Knockout® Rose, Rosa ‘Radsunny’? It’s been blooming steadily all summer long. And all summer long, the aster, Symphyotrichum oblongifolium ‘October Skies’ has been growing, branching, and budding up. ﻿Slowly, surely, it will bloom and provide a bright spot to end this dry season in the garden. Just post on your blog about what is blooming in your garden on the 15th of the month and put your name and the url to your post in the Mr. Linky widget below. Then leave a comment to tell us what you have waiting for us to see so we can pay you a virtual visit! You're so right, Carol, live and garden with your current reality. That's what we've been doing. One perk of renting -- we don't pay the water bill so watering the veggies hasn't been too bad, but just noticed that even our established bushes are starting to look not-so-great. Insomnia helps me post early for Bloom Day. There are lots of flowers blooming but they are all spread out over the garden. It is like playing hide and seek. Happy Bloom Day, Carol. Hope you are safely home and tucked in tonight. That rose is a knockout, as they say! We've had a rainy summer but suddenly it's dry here, too, and a number of plants are already showing stress from warm dry weather. Carol, that goldenrod is stunning! Thanks for hosting, and wishing you a wonderful gentle rain that does not beat down what's blooming. More is growing in your garden than mine! August hits hard! You have more blooms in your gardens then I do we are very dry and praying for some rain. I do have a few faitfuls still hanging in my knockouts and some daylillies. And some Roses just planted this summer are starting to give me blooms now that our temps are cooler. Come visit and hope everyone has a great garden day!! Sorry to hear that that your beautiful new garden is desperately needing some rain. I hope you get some soon. I really like the colours in that rose bud and that aster is certainly going to give you a great show of colour soon. We've had plenty of rain here in Scotland - strange weather this month normally September is better than this. I'm not a rose grower, but that yellow knockout is seriously tempting. Would it do in a large pot? I see I'm not the only one with insomnia. What happened to the rain this year? It seems as if you got all of August's rain in June. And what's up with ex-Aster 'October Skies'? Mine also has just a couple of blooms instead of the cloud of them it usually has at this time of year. Love the Delphinium with the rough wood of the fence. 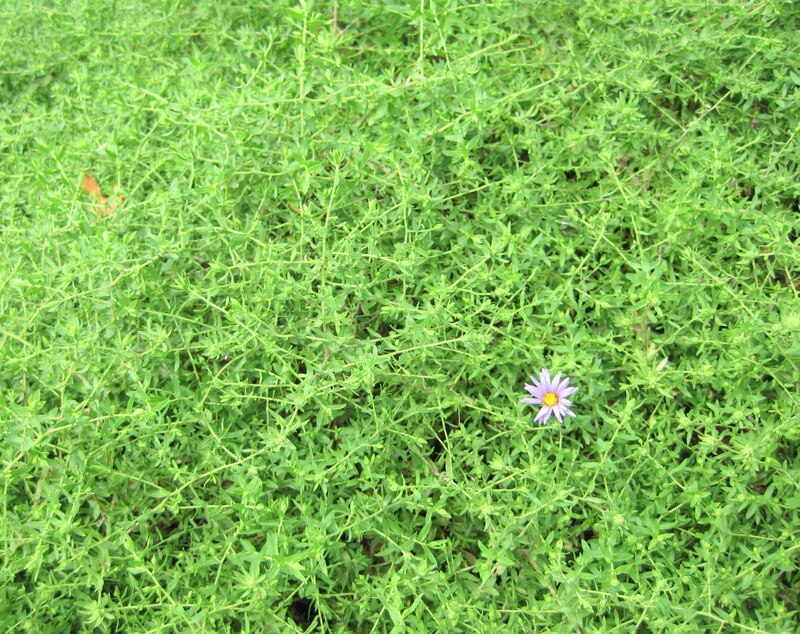 I can imagine the aster bush in full flower. Your Solidago seems to be a special variety. I hope you get rain soon. We are having a surfeit of it. Brutally dry here in PA too, Carol. I don't know how anything has made it to this point. Your goldenrod really is a beauty, though. It's great to have a goldenrod vying with a rose for top honors today. Thanks for hosting Bloom Day. I love the concept. Hoping you get rain as we need it pretty much everywhere. We got some this week, but certainly, not enough. The flowers of bloom day always look good regardless. Bumper crop of goldenrod here. Thanks for hosting. Bloom day scans are here: http://remarc.com/craig/?p=1083 And don't forget scanning is them for Picture This contest coming up in October at Gardening Gone Wild. Hi Carol, we feel your pain with the lack of rain and scarily sad situation. Mature trees are looking very poorly right now, but you still have some fabulous flowers! 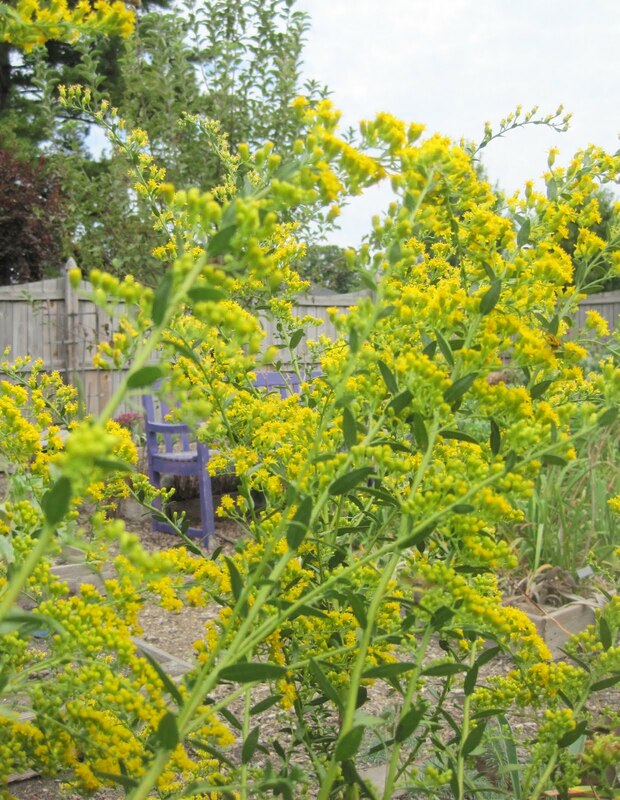 That goldenrod is very special, you are doing a good deed by helping it flourish. Our October Skies is also covered with buds, none open yet. It blooms here in October, with the muhly grass peaking. I see lack of rain makes of have much in common this month. At least here we occasionally have the benefit (or threat) of tropical storms. Thank you for hosting another GBBD. We were hot and dry in August here in Nebraska, but September is bringing some relief. It's been in the lower 80s, and getting down to the 60s at night. We've also had a little rain. Maybe it will come your way. I like your delphinium and goldenrod. The asters do like to tease this time of year, hanging onto those buds awhile. I went out and took lots of photos of annuals and perennials, some that have blooming awhile, and others just opening. Thanks Carol for hosting September Garden Bloggers Bloom Day. Things are really winding down in my garden too. We could use a deep drenching rain to get the plants through the season. Carol - this has been a difficult summer, but I was surprised to find so many flowers in bloom, although as in Layanee's garden they are all spread out. Thank heaven for zinnias and wild goldenrod. Dry, dry, dry here in south-central CT and even with minimal watering blossoms thrive. My solidago is also a beauty this year, growing on the wild edges along the woods. Wild solidago along roadsides and in wild meadows is fantastic this year. Early season rains must have suited it. Thanks for hosting another GBBD. My garden is crying for rain as well...it's been a tough summer esp for my young perennials and shrubs. Have a great day and thanks for hosting! It's been terribly dry here too Carol, but at least the temperatures have started to moderate somewhat. Radsunny is beautiful. I love the delicate, airy look of switchgrass in bloom, though it isn't easy to photograph. I'll join you in a rain dance, Carol! My petunias and callibrachoas have withered up and died in their pots despite all my attempts at regular watering. Somehow it just isn't the same as a nice rainfall. Your Rosa 'Radsunny' is a favorite of mine, too; I love that pale yellow. My garden would love a long steady steady rain, the trees and flowers are all looking tried. You do have a lot still blooming in mid September. Your roses are very pretty! We, too, are gardening with the weather we have. Which means our roses have black spot and are looking a little ragged. I'm hoping to post a picture of my rose 'Spice' next month for GBBD. She's still a little worn out from summer. Thanks again for hosting! Love that Solidago. Love the rose - what a great color. I hope to have roses in my garden one day. They say a garden is not complete without roses. I think we might have some of your rain. If I can I can send you some rain, last week parts of my garden was flooded. I do hope that the rain gods have mercy on your garden. Hi, Carol! I'm in love with your knockout rose...the deep yellow fading to white (or the opposite way) is spectacular! Goldenrod is is bloom down here too. Very pretty! Happy GBBD!! Love the yellows in your garden (I've never seen that color knockout rose, but it's beautiful, almost like a wild rose with the single petals). And a late delphinium is very exciting. Hope you get some rain soon, and thanks for hosting bloom day! I look forward to it every month. I really love the color of that Delphinium! I decided to do something a little different for bloom day this time, and instead I took pictures at a friend's garden. I hope that's not considered cheating! Sorry I didn't make it to Dallas - I really miss everyone! We're suffering from a lack of rain too...hopefully some will arrive this week. I have lettuce seedlings that I'm trying to coax along. My garden needs more rain too, but we do have cooler weather so the garden is looking a little fresher than it was. Thanks for hosting Carol. Despite the lack of rain you have some great blooms. Carol, I have got to try that Radsuny Rose next year. Is it fragrant? We haven't seen rain since May, but it's totally normal here in the Bay Area. We have a lot of succulents that can deal with a once a week watering. Your blooms are beautiful despite the lack of water! Hi Carol, your blooms do look beautiful. We are dry but dry is our nature in the Black Hills of SouthDakota. So I have years of xeric gardening. But, the plants that will survive with little water, will thrive with just a bit of cool and rain, so my garden is doing ok.
Love that Radsunny rose! We have had so much fog drip this year our foliage is going mouldy! Too bad we can't share! Thanks, as ever, Carol! Someday I'll figure out how blogger works and manage a post that also LOOKS nice. Anyway, gorgeous flowers everyone! Still working my way through! This looks to be our last dry day for the rest of the week; I wish I could send some of the rain your direction. We need more summer sun out here in Portland! As always thank you for hosting bloomday! The goldenrod is beautiful Carol! Love the sign, have a great GBBD! Like you, I couldn't find a lot, but still more than I had expected. Thank you for hosting and making me walk round and take a thorough look at things out there. Hi Carol, While your garden cries for rain, we've been crying for 'summer'! Hope you get your wish, and we'll keep our fingers crossed we'll have a summer next year. I see that we have 'Radsunny' in common. It's been a real winner for me this year. My GBBD post is up and I invite your readers to visit. Thanks for hosting us once again, Carol. Posting on behalf of Jennah's Garden, she is on vacations but she left some lovely photos of her blooming garden for us to see. She has roses, zinnias and more. Your garden looks great carol! The Solidago is amazing, I'm sure it's full of wildlife. And love the photo of the single flower and in the October skies. Hi Carol! It's really difficult to take good photos of Heucheras, but that Knockout is wonderful - must be fabulous in real life as well! I'd be happy to share this summer's rain with you as we had too much. So many great things are in bloom now! What's more fun, the flora or the fauna? We've had some rain, but it's been so dang hot... well... things are growing, at least! I'm back to posting after a summer of procrastination..
We're in a serious drought here on the East Coast. Thankfully Autumn temps and weather have begun to give us a break from all of the nasty heat and humidity this Summer. Silly me! I just realized that I posted the link to my August GBBD on #67 above. I've reposted (in #79) a link to September's post. (I wondered why I was getting comments on August 15's post!) I do hate it when I do stupid things like that. I hope you get some rain soon, Carol. I posted a traveling Bloom Day, from my recent visit to Madison, Wisconsin. No rain on the horizon in California either, not for at least a month where I am. I confess I've been watering too. Hey, Carol, sorry I missed you in the Big D!! Also, that I'm doing a really lame job of Bloom Day-ing this month. my plants all look so sad and dry.. I do have a lot of water plants in my ponds that are GREEN.. but no blooms.. I had high hopes for a chinese pumpkin plant that up unitl today had been beautiful now it is sad looking too.. we need rain here..
Carol, This is the kind of season where we find out which plants can handle tough times. I think the only reason my garden is not completely fried is the unusually heavy snow that fell here in winter, giving all the plants a fully hydrated start in spring. Love the yellow knockout rose. I have a single flower hot pink I love, but yellow's my absolute favorite. I think I might need to pick one up! I feel the same way about the rain. The ever-so-slightly cooler weather has helped though! Love that sunny yellow Knockout! Well gee it sounds like everyone is suffering from drought. I suppose it is a bit dry when I go down the mountain and we have gone a whole week between dramatic applications of 2 inches of rain. All is well in the land of the sky though. And there may be an aster or two and a bit of goldenrod blooming for my Bloom Day post. Carol,thanks so much for hosting this page.It's so much fun checking out all the gardens.I especially love your blogs ,you really have a way with words. I'm very sorry that you continue to suffer drought in your garden. I know how devastating that is to the plants and discouraging for the gardener. I look forward to fall rains more than any other event in the gardening year. Hope you get some rain soon (just not 12 inches in one day like Austin did). Hi Carol, I haven't participated in so long... and yet, this is one of my favorite times to post. Thanks! I wish my goldenrod looked like yours! Mine is in my Woodland Walk which I don't water, and it fried this summer. Love that Radsunny. I really appreciate your hosting this event every month. I love the delphinium! They don't do well here in NC. They'll bloom, but they never last through a summer. Love the bright and beautiful yellow hues in your garden right now. That Goldenrod is amazing. Sounds like you all had a great time at GWA. I'm in for next year! Happy GBBD. hi carol, it was so nice seeing you at gwadfw! seeing all those gardens in dallas made me realize how much work i have to do in my garden... thank goodness the cool season is upon us. here's to enjoying your fall garden and thanks for another gbbd! We've had some rain here lately and cool, windy days - much too fall-like for my taste. I hope some of the rain comes your way. We've had lots of dry weather this summer too, and I've done my share of watering. It keeps us from doing those other garden jobs we'd rather be doing. Radsunny is a hard little worker. She's a beauty! Right now your garden has the yellow I am craving, Carol, and as for the rain you need? We've had too much at once. This year seems to prove old Henry Mitchell knew his stuff when he said it isn't nice to garden anywhere! It took so long to make this post that it isn't really GBBD in Austin, but it must still be Bloom Day somewhere! Had a little trouble posting my Bloom Day entry, but I'm confident it's still the 15th somewhere on this planet. Not much in bloom in my small kitchen garden so late in the summer, but I think I caught some keepers! I hope you get some of the big rains we received last week! 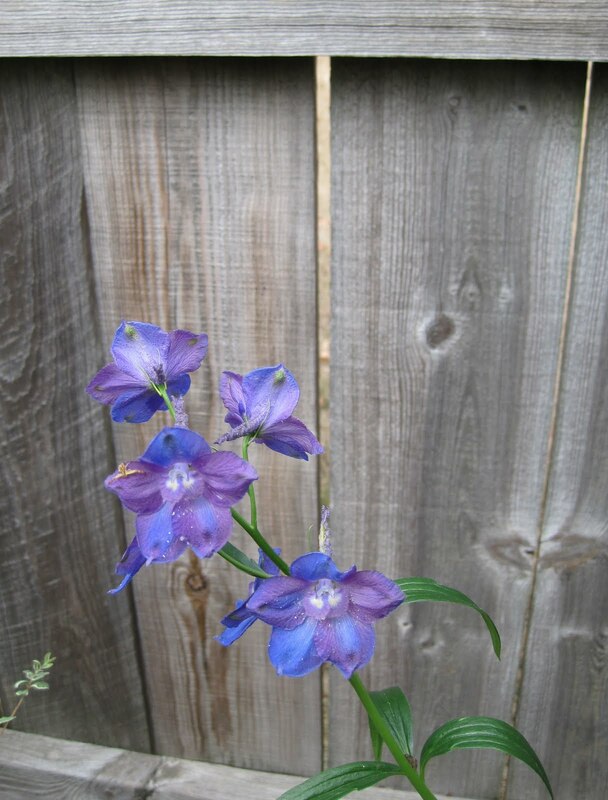 Your delphinium is stunning--can't stop staring at that color. I'm a day late, but my GBBD post is now up. Thanks for hosting! You're cool with the 15thish of each month, right? Haven't joined in the fun for a few months, and I'm a wee bit late, but better late than never, right? Carol, I simply MUST have one of those Radsunny Knockout roses! Maybe a whole front garden of them, in fact. Sorry to be late - and I have had to cheat, showing photos of someone else's garden! I thought I had nothing blooming this month - until I took another look...vegetables are plants too! I have very little blooming in my garden now. The wild flowers are the only things except for Solidago Fireworks. It isn't as full of buds as usual but I guess it should be expected with this drought. Thanks Carol for hosting Garden Bloggers Bloom Day! The 15th sure does sneak up on us every month - doesn't it??? I just entered - late! But anyway ;) Thank you for hosting!